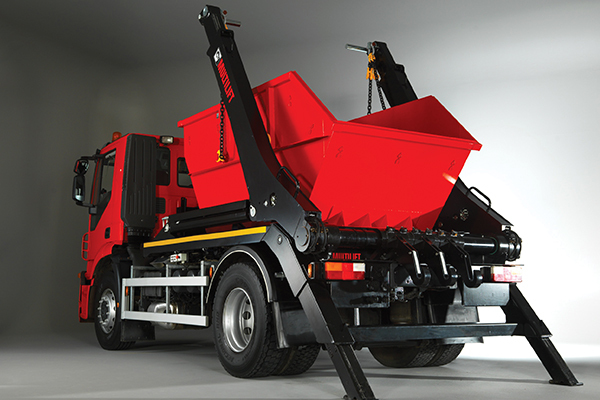 Hiab’s latest range of skiploaders is helping position the company for future trends in the waste management sector. Since ski manufacturer and Swedish inventor Eric Sundin founded Hiab in 1944, the company has become a leader in the load-handling industry. The product of Sundin’s entrepreneurship, the Hiab Method, resulted in more than half a million loader cranes being used by people in 120 countries around the world. Its products range from loader cranes, to truck-mounted forklifts, forestry and recycling cranes hooklifts and skip loaders and tail lifts. In 2018, the Australian arm of Hiab is preparing itself for the release of its latest skiploader, the MULTILIFT Futura 18, expected this quarter. With significant improvements on the previous iteration, the MULTILIFT Futura 18 skiploader boasts an 18-tonne capacity in a single trip, along with other increased productivity features and decreased fuel consumption and emissions. Steve Lelean, Hiab Australia National Product Manager-Moffett, says the launch of the model strengthens the company’s position in the global skiploader market. He says Hiab’s drive for innovation is best described by the Japanese concept of kaizen – which refers to continued improvement of an organisation. Steve says the design of the MULTILIFT Futura 18 offers greater fuel efficiency through a combination of design innovations and improvements. The swan-neck arm, which allows independent arm movement, provides the operator greater positional control of the load, reducing truck movements as a result. He notes the use of EvoLight steel in the construction of the skiploader, which helps maximise the payload without compromising on strength. The steel, he says, has less mass compared to traditional types used, but is stronger, allowing for greater payload and faster operation. He says over the typical lifecycle and combined with faster cycle times, this provides greater efficiencies and fuel savings. This design thinking also applies to the MULTILIFT XR26S hooklift range. In terms of maintenance costs, the skiploader is designed with longevity in mind, Steve says, adding that the MULTILIFT Futura 18 skiploader can be optioned with maintenance features that advises the operator when maintenance is required. For those less inclined to schedule their maintenance, it can carry out a basic performance check without the need for specialised tools. Steve says when it comes to safety, for those using DIN standard skip bins, the company’s safety plus hydraulic side and rear locks are a more efficient and safe option. For those using alternative designed skips, there are numerous lashing points for straps, he adds. The ability to customise the skiploader is aided by the flex control system, which provides the user with a combination of options from faster operational speed to control locations options: outside, in-cab, radio remote controls or a customised combination. “Quite commonly, if you have one set of controls in one position, there will always be a blind spot,” Steve says. Talk of safety leads Steve to a discussion of Australian legislative trends when it comes to the loading and movement of skips. Load restraint is a topical issue in the waste management industry, along with weight, Steve says, as the legislation has recently been updated in collaboration with the National Transport Commission. Steve says the flex control system offers an optional “indicative weighing system”, enabling drivers to monitor the weight of their load in real time. Establishing and maintaining relationships with buyers and contractors in the waste industry is also a critical part of Steve’s job, who remains ahead of the curve on equipment requirements.